No. 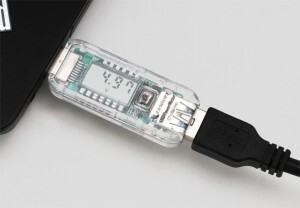 4th, USB Power Voltage and Current Measuring Device! The current and voltage values cannot be measured correctly if the meter display of CT-USB-PW has not be back to 0 while the power switch is just turned on. 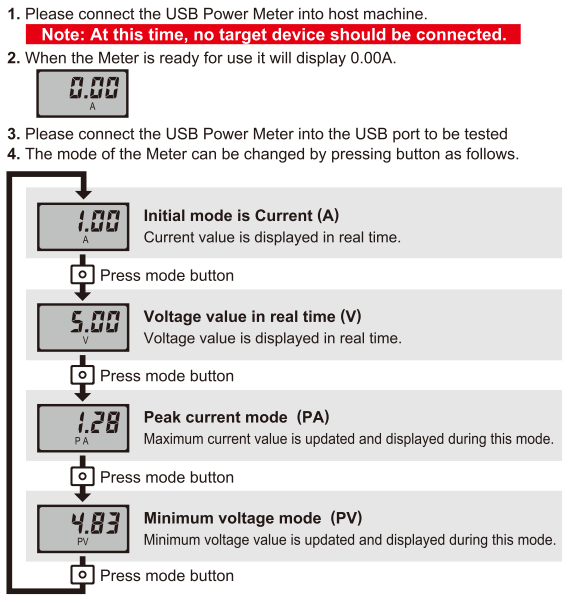 After the meter display turns back to 0, target device can be changed for measurement while CT-USB-PW is connected with the Host-side. 1. Please connect the USB Power Meter into Host machine. Note: At this time, no target devices should be connected. 2. When the Meter is ready for use, it will display 0.00A. 3. Please connect a target device to the USB Power Meter. 4. The mode of the Meter can be changed by pressing button as follows. ※ Cannot promises to support all the computer equipments in the nature of the product.